The Fujifilm FinePix S1000fd (announced 24 January 2008) is 10.0 megapixel camera with 12 x optical zoom lens (equivalent to 33mm – 396mm). The Finepix S1000fd features a large 2.7” high-resolution (230k pixel) LCD plus electronic viewfinder (EVF) and ISO levels of up to ISO 1600 at full resolution and ISO 3200 at 3 MegaPixel resolution. It has a CCD sensor, face detection and red eye removal functions. 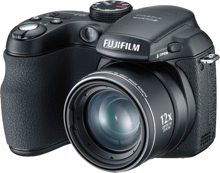 Expect to see the Fuji FinePix S1000fd in stores in April 2008 with a retail price of $249.99 USD. Buy this camera now at Amazon. FUJIFILM U.S.A. Inc. today announced the successor to the wildly popular SLR-styled FinePix S700 with the introduction of the world’s smallest digital camera with a 12x optical zoom, the FinePix S1000fd. Perfect for advanced amateur photographers who want an affordable, step-up digital camera, the 10-MegaPixel FinePix S1000fd builds on the legacy of the FinePix S700 with the addition of a Fujinon 12x optical zoom (33mm-396mm equivalent) for greater range and flexibility, Fujifilm’s proprietary Face Detection Technology with Automatic Red Eye Removal, and a brand new Panoramic Shooting mode. Rounding out the FinePix S1000fd’s powerful feature set is a large 2.7” high-resolution (230k pixel) LCD plus electronic viewfinder (EVF) and ISO levels of up to ISO 1600 at full resolution and ISO 3200 at 3 MegaPixel resolution. * Picture Stabilization mode: A selectable mode, Picture Stabilization uses the heightened sensitivity of the FinePix S1000fd and high-speed shutter settings to reduce blur caused by hand-shake or subject movement. It allows the camera to automatically choose the correct light sensitivity and optimal shutter speed to produce clear, blur-free images. * Full Manual Photographic Control: Photo enthusiasts and advanced photographers have total control with manual adjustment options for various camera settings including resolution, ISO, aperture, shutter speed and more. * High Speed Shooting: Capture the action with the High Speed Shooting mode: 7.5 fps @ 2MP for 15 shots; 3.3 fps @ 5MP for 6 shots; and 1.4 fps @ 10MP for 3 shots. * Movie Recording: VGA quality at 30 frames per second with sound. * 14 Pre-programmed Scene Modes: The FinePix S1000fd features 14 pre-programmed scene modes that offer a one-touch setting for almost any situation, including: Portrait, Landscape, Sport, Night, Fireworks, Sunset, Snow, Beach, Museum, Party, Flower, Text. * xD / SD / SD-HC Compatible slot: The FinePix S1000fd features an “xD/SD Compatible slot” which accepts not only Fujifilm’s traditional xD-Picture Cards but also Secure Digital (SD) and SD-High Capacity/SD-HC cards too.